Background: The notion that proteasome inhibitor bortezomib (BTZ) induced intracellular oxidative stress resulting in peripheral neuropathy has been generally accepted. The association of mitochondrial dysfunction, cell apoptosis, and endoplasmic reticulum (ER) stress with intracellular oxidative stress is ambiguous and still needs to be investigated. The activation of activating transcription factor 3 (ATF3) is a stress-hub gene which was upregulated in dorsal root ganglion (DRG) neurons after different kinds of peripheral nerve injuries. 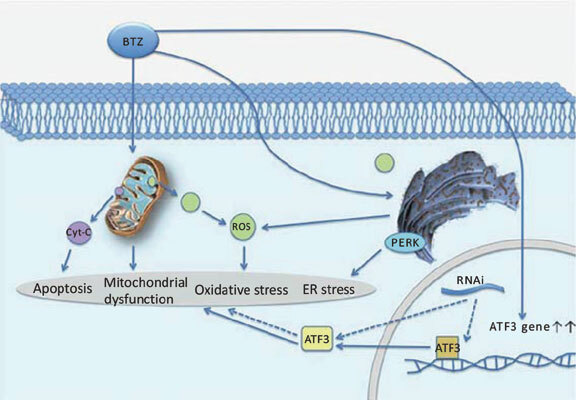 Objective: To investigate a mechanism underlying the action of BTZ-induced intracellular oxidative stress, mitochondrial dysfunction, cell apoptosis, and ER stress via activation of ATF3. Methods: Primary cultured DRG neurons with BTZ induced neurotoxicity and DRG from BTZ induced painful peripheral neuropathic rats were used to approach these questions. Results: BTZ administration caused the upregulation of ATF3 paralleled with intracellular oxidative stress, mitochondrial dysfunction, cell apoptosis, and ER stress in DRG neurons both in vitro and in vivo. Blocking ATF3 signaling by small interfering RNA (siRNA) gene silencing technology resulted in decreased intracellular oxidative stress, mitochondrial dysfunction, cell apoptosis, and ER stress in DRG neurons after BTZ treatment. Conclusion: This study exhibited important mechanistic insight into how BTZ induces neurotoxicity through the activation of ATF3 resulting in intracellular oxidative stress, mitochondrial dysfunction, cell apoptosis, and ER stress and provided a novel potential therapeutic target by blocking ATF3 signaling. Oxidative stress, mitochondrial dysfunction, cell apoptosis, endoplasmic reticulum stress, activating transcription factor 3, bortezomib, neuropathy, dorsal root ganglion.